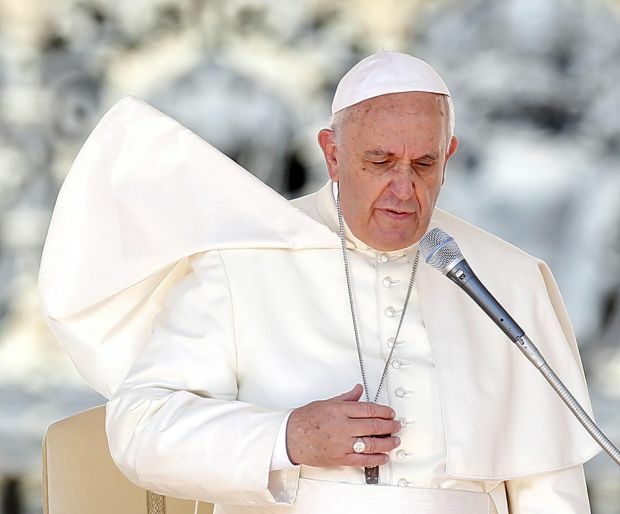 VATICAN CITY (CNS) — God isn’t afraid of getting his hands dirty, being inconvenienced or even scorned because he will do whatever it takes to save everyone from sin, Pope Francis said in a morning homily. “A true priest, a true Christian, have this zeal inside that no one should be lost. And for this reason they aren’t afraid of getting their hands dirty. They’re not afraid,” he said Nov. 6 during his morning Mass in the Domus Sanctae Marthae where he lives. “They go where they must, they risk their life, risk their reputation, risk losing their comforts, their social status, even losing their ecclesiastical career, too. But they are a good pastor, and Christians must be this way, too,” he said, according to Vatican Radio. The pope’s homily focused on the day’s Gospel reading from St. Luke (15:1-10), in which Jesus explains to the scandalized Pharisees and scribes why he welcomes and eats with sinners. “It was a real scandal back then” for anyone to associate with such sinners, the pope said. “Imagine if there had been newspapers back then!” he said, implying there would have been many shocking headlines. The scribes and Pharisees, on the other hand, “go halfway. They care about having the balance sheet of profits and losses be more or less in their favor,” so the thought of losing a few sheep doesn’t bother them in the least as long as they can say “I earned a lot” in the end. The pope said, “It’s sad” when priests and Christians today only go “halfway” in sharing God’s love and salvation. “It’s sad, the priest who opens the door of the church and stays put, waiting. It’s sad, the Christian who doesn’t feel deep down, in his heart, the need, the necessity to go and tell others the Lord is good,” the pope said. “How much perversion there is in the heart of those who believe themselves righteous, like these scribes, the Pharisees. Oh, they don’t want to get their hands dirty with sinners,” he said. “A priest must have God’s heart and go all the way” because he wants no one to be lost, the pope said. Lay Christians must do the same. “It’s so easy to condemn others,” the pope said, “but it is not Christian, you know? It is not what children of God do. The children of God go all out, give their lives for others, like Jesus did. They cannot be at ease, taking care of themselves and their comfort, their reputation,” he said. NEXT: Reader wonders: Is it time to find a new parish?